‘Tis the season to give back. It’s that time of year to collect donations of toys for Toys for Tots and non-perishable food for the Ralph Reeder Food Shelf. Help The Gorman Center for Fine Dentistry make a difference in the lives of our Minneapolis and Saint Paul neighbors by stopping by our office to drop off your donations now through December 20th. “It is our goal to generously support our local communities, especially during the holiday season, to organizations like Toys for Tots and Ralph Reeder Food Shelf,” said Dr. Steve Gorman. The mission of the Marine Toys for Tots Program is to collect new unwrapped toys and distribute those toys to less fortunate children at Christmas. Their goals are to help bring the joy of Christmas and send a message of hope to America’s children who might otherwise not receive a gift. The Ralph Reeder Food Shelf is a Community Education Program of the Mounds View Public School District. Their services are primarily available to low-income families and individuals living in our school district or Ramsey County who may find themselves in need of food. In 2017, there were more than 23,000 visits by individuals to the food shelf and they distributed 641,000 pounds of food and personal care items, including fresh milk, frozen meats, produce, non-perishable food items, hygiene, cleaning, and baby supplies. 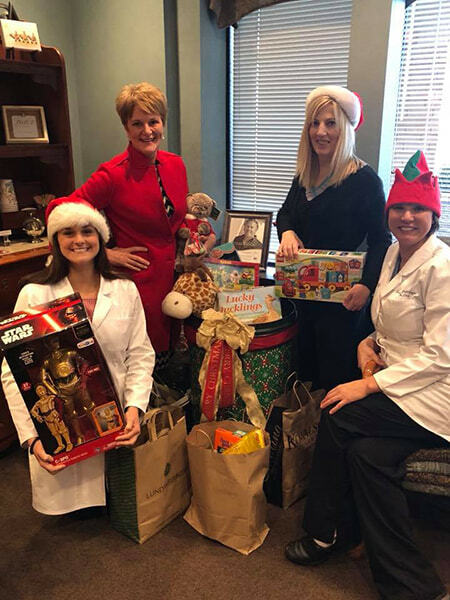 Help our local communities and children in need this holiday season by dropping off a toy or non-perishable food item to our dental office in North Oaks. Drop off hours are Monday through Thursday 7:00 am to 4:00 pm. We look forward to seeing you. Wishing you and your family a wonderful holiday season.